Aluminum pyramid style frame with two engraved nameplates, one on each side. 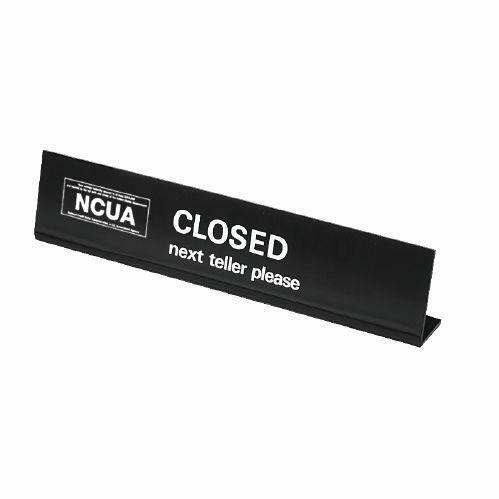 Nameplates feature your choice of copy - Next Teller Please or Next Window Please with an arrow on each side, arrows on each side point in opposite direction. Available without arrows when specified. Available in 3 Frame colors - Black, Silver and Gold. Choice of Engraved Nameplate colors - Gray with black letters, Green with white letters, Cocoa with white letters, Black with white letters, Walnut with white letters, White with black letters, Red with white letters, Blue with white letters, Brown with white letters, Gold with black letters, Silver with black letters. Choice of Typeface - Gothic (standard), Gothic Italic, Helvetica Medium, Helvetica Medium Italic, Clarendon, Clarendon Italic, Optima Bold, Optima Bold Italic, Times Bold, and Times Bold Italic. Choice of Lettering - Upper Case (Standard), Upper and Lower case, or lower case. Backplate size 7 1/2"W X 2"D X 2"H. Nameplate size 7"W X 1 1/2"H. Signs sold individually. Plexiglas Pyramid style frame is visible from both sides. Black Plexiglas Pyramid frame. 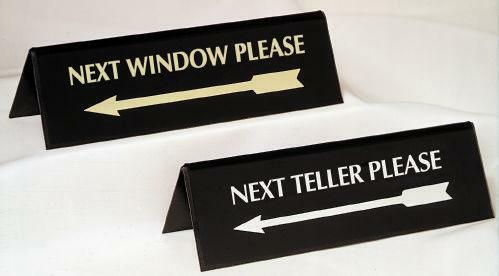 Signs feature your choice of copy - Next Teller Please or Next Window Please with an arrow on each side, arrows on each side point in opposite direction. Choice of Silver or Gold lettering. Available in the shown typeface only. Size 7 1/2"W X 2 3/8"H X 2 5/8"D. Signs sold individually. Plexiglas Teller Signs, easel style, with "Closed" wording clearly visible with next teller please in white lettering. Choice of Signs with FDIC logo, NCUA logo, or No Logo. Size 12"W X 2 1/2"H. Signs sold individually. Sign is engraved with your custom message. Available with clear plexiglas base for counter display or adhesive back for mounting on walls. Either Counter style or Wall style sign is size 9"W X 6"H. Choice of Engraved Nameplate colors - Gray with black letters, Green with white letters, Cocoa with white letters, Black with white letters, Walnut with white letters, White with black letters, Red with white letters, Blue with white letters, Brown with white letters, Gold with black letters, Silver with black letters. Choice of Typeface - Gothic (standard), Gothic Italic, Helvetica Medium, Helvetica Medium Italic, Clarendon, Clarendon Italic, Optima Bold, Optima Bold Italic, Times Bold, and Times Bold Italic. Choice of Lettering - Upper Case (Standard), Upper and Lower case, or lower case. Sign sold individually. Available in Counter Slant-Back Style and Wall Style with Suction Cups. Size 7"W X 5"H Sign with white surface screen printed copy. 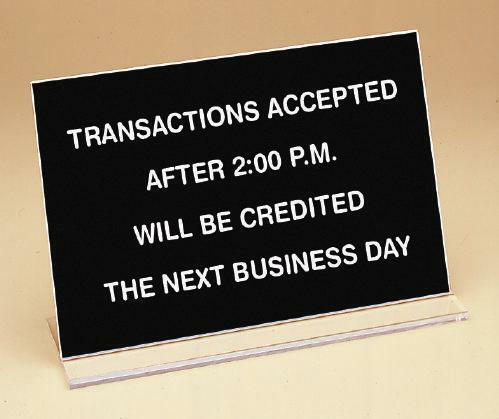 Example wording - Transactions Accepted After 2:00 P.M. Will Be Credited The Next Business Day. Specify Hour when ordering. Signs sold individually. Size 7"W X 4 1/2"H. Free Standing Metal Frame Base with Subsurface Magnetic Information Strips. Available in black with white letters and white with black letters. Specify time when ordering. Example wording - Deposits Received After 2:30 P.M. Will Be Credited On The Next Business Day. Signs sold individually. 7"W X 5"H Sign with movable clock hands. Available in counter and wall models. Wall models supplied with suction cups. Wording on sign - Deposits received after this hour will be credited on the next business day. Signs sold individually. Single-Sided, 8 1/2"W X 11"H, Styrene material, Signs come complete with 12 holidays, 6 days of the week, months and dates that slide into channels. Black with white copy. Available in Door/Window Mount with suction cup included and in Countertop model. Signs sold as complete sets. Counter style, size 10"W X 7"H, includes number set from 1 to 50 that slide into channel. Available colors are black with white copy and green and red with white copy. Signs sold individually. **Additional styles of Counter Signs available, for details use Contact Us tab on our website or contact Roger Zavodny directly by e-mail at roger@myvaultllc.com or by phone at 440-346-4593.